Bettys is without a doubt, quintessentially British, and epitomises the phrase 'afternoon tea'. Having the opportunity of being able to visit the Bettys Cafe in Harrogate regularly and each time I do so, I always order myself their 'Strawberry Ice Cream Milkshake', it is beyond delicious! 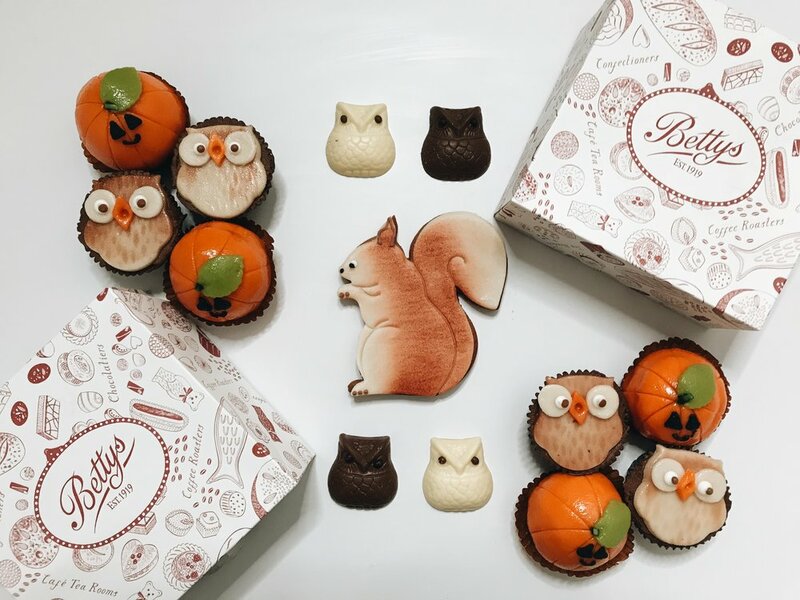 So it is safe to say that I am a huge lover of all things Bettys, and I was completely blown away when I had received an incredible package, full of Bettys Easter Treats! Both equally as nutty and chocolatey, this egg is perfect for those who like a bit of crunch! Unfortunately this is now sold out online (no surprise there!) however, will be available at your local Bettys Cafe. A small collection of white and milk chocolate rabbits, each have been hand decorated with dark chocolate eyes and presented on a milk chocolate base! A beautifully hand-decorated Swiss Milk chocolate egg with a white chocolate chick emblazoned across it! Both equally as appealing to children, and adults. A collection of butter biscuits in the shapes of doves, rabbits, chicks and eggs! 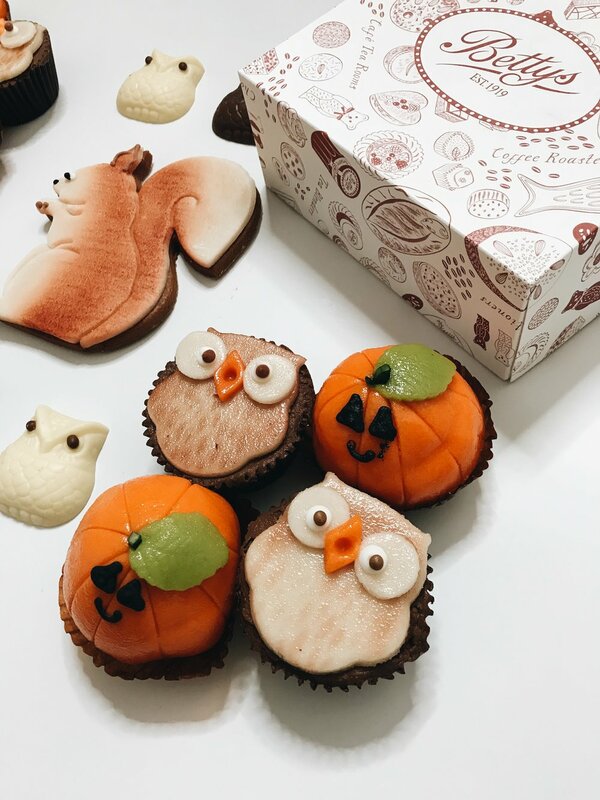 All of which have been decorated with Royal Icing. An absolute show-stopper! Guaranteed to win over your family and guests on Easter Sunday! An intense, rich chocolate cake with chocolate ganache and raspberry preserve. Dark chocolate curls decorated on top with a handful of ganache-filled chocolate eggs. An incredible take on the classic Easter treat, a Hot Cross Bun which has large chocolate chunks with candied orange! I particularly love the fact that this can be cut as if it was a cake. 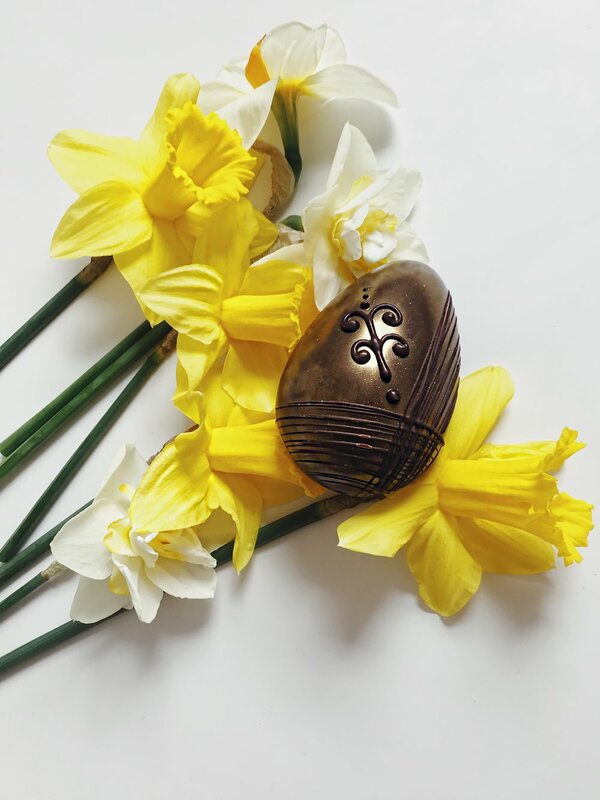 Wrapped in Gold Foil, a stunning display of handmade chocolates are encased within the Swiss Grand Cru Milk Chocolate Egg! They include Rose and Violet Creams alongside Vanilla Caramel Hearts. 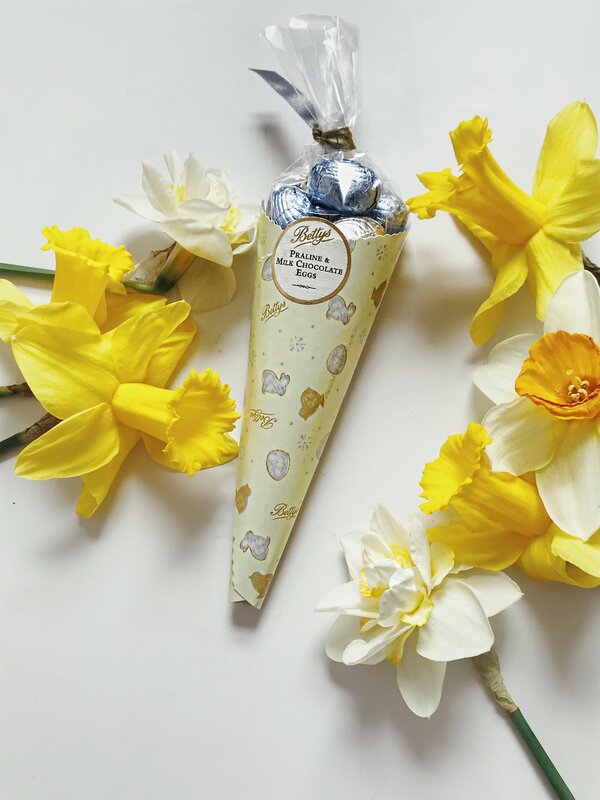 To view the full Bettys Easter Range, click here. Have you visited Bettys before? If so, which cafe did you visit? What do you order when you go? Will you be trying out any of these Easter Treats? Which sounds most appealing to you? Do let me know your thoughts below, as I would love to hear from you! Also, don't forget to click that 'like' button! I can almost 100% guarantee you that whenever you mention the town 'Harrogate', the immediate sentence afterwards will be; 'Ooo is that where Betty's is? It's lovely!' 100%, I'm telling you. So when I received the invitation to attend their Magical Christmas Bloggers Event, I felt as though I had achieved a personal goal! Betty's is without a doubt a household name, and a British staple for all things tea and cake. Despite having gone to the Betty's in Harlow Carr (an area within Harrogate), I had never actually visited the one in central Harrogate, I know, it's shocking! Prior to attending the event, for some reason unbeknownst to me, I was rather nervous... More so than any other event I had attended before! However, as I made my way upstairs, the nerves quickly disappeared, and I met the lovely ladies; Sunshine Sarah, The Harrogate Girl who was the host for the afternoons event, and Harrogate Mama! As I took in the stunning sights of the table displays, I was in awe of the sheer attention to detail, and how grand, yet versatile they each looked. Christmas Spice - The most traditional table out of the three, with dashes of the classic colours, reds and greens, with elegant gold tones, inspired by the scents and smells of Christmas Baking! Continental Elegance - This table grabbed my attention straight away due to the show-stopping Swiss Alpine Village! Out of the three tables, this was my favourite. I loved how traditional the table setting was, yet it had a modern twist to it. Winter Snow - A modern table, decorated in silvers and golds. Highly elegant, and one that has a 'Winter Wonderland' feel to it! After having taken countless photographs, we then sat down ready for some afternoon tea. As a newbie to the 'Tea World', I opted for the 'China Rose Petal' as it sounded rather pretty.. Presumptuous, I know. However, I seemed to have struck gold with my choice as this was truly delicious! For starters I had several scones with cream and jam, followed by small portions of food to nibble on, ending with gorgeous little bites of their desserts! I must say, their desserts were exceptional, with the little red, dark chocolate square being a firm favourite of mine. Much to my disappointment, unfortunately the red chocolate squares aren't available to purchase, however they are exclusive to the 'Lady Betty Afternoon Tea' upstairs in the Imperial Room! A perfect excuse to go back for more right? Once we had our food, we were then split into three groups for the afternoon's activities. The first activity began by us unwrapping our gift from underneath the Christmas Tree, in which I received their 'Christmas Stollen'! A spiced fruit bread layered with marzipan, dipped in melted butter and rum, topped off with fine sugar. Delicious! 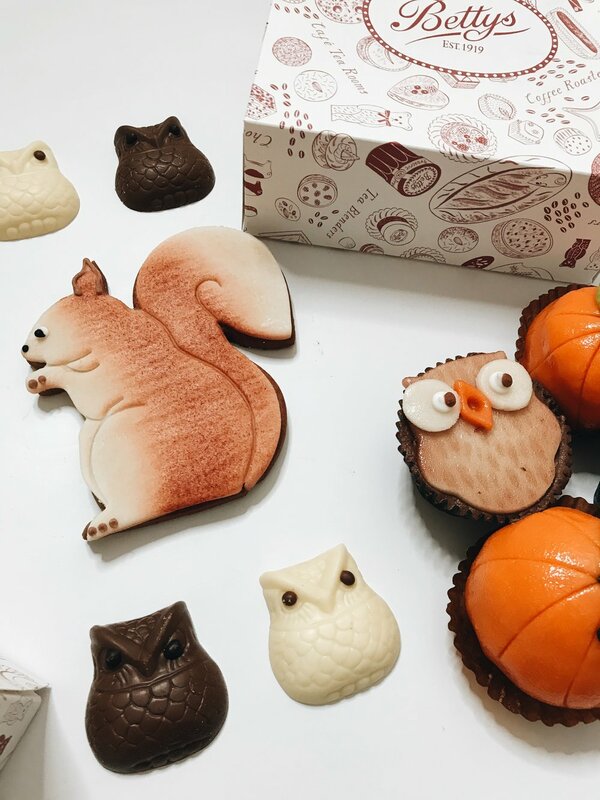 For our next activity, we were told by the inspiration of some of the Christmas Treats, and the process of how each one is made and where their inspiration came from. The most fascinating treat for me, was their little chest of drawers, in which each drawer had dozens of chocolates hidden away inside. The inspiration behind that, was a trip abroad where one of the chefs stumbled across a small jewellery cabinet and came back to recreate that! Our last activity, we were taken around each of the three tables as mentioned previously. As the event drew to a close, we were given a goody bag which consisted of a £10 gift voucher! I am still yet to use that voucher.. Do you have any suggestions on what I should buy? I left the event on a high, and I feel very honoured to have been asked to such a wonderful event. To view the Betty's Christmas Range in full, you can click here for more treats! Have you visited Betty's before? If so, what do you normally order? Have you viewed their Christmas Range yet? What should I purchase from their Gift Shop with my voucher? Do let me know your comments down below, and don't forget to give this post a 'like'!